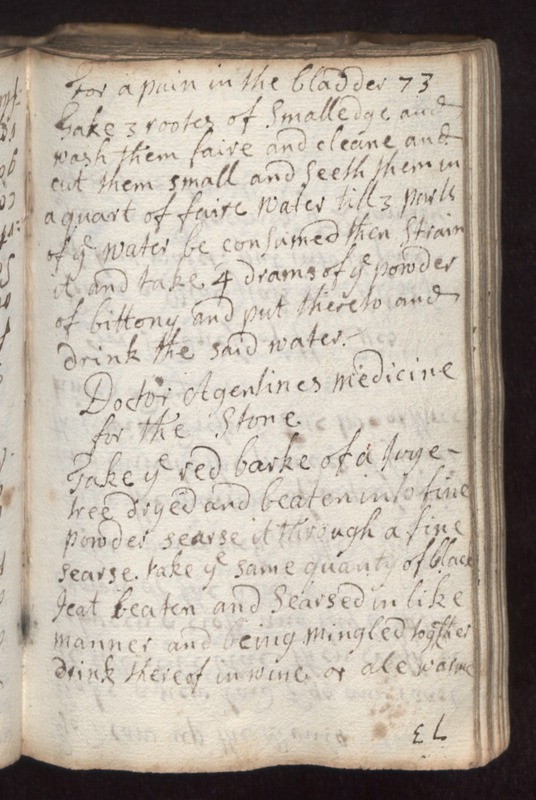 73 For a pain in the bladder take 3 rootes of smalledge and wash them faire and cleane and cut them small and seeth them in a quart of faire water till 3 parts of ye water be consumed then strain it and take 4 drams of ye powder of bittony and put thereto and drink the said water. Doctor Agentines Medicine for the Stone Take ye red barke of a [Joye?] tree dryed and beaten into fine powder seavse it through a fine seavse take ye same quantity of [glace?] [feat?] beaten and seavsed in like maner and being mingled together drink thereof in wine or ale warme.